This quickstart presents the most basic scenario for protecting APIs using IdentityServer. We will define an API and a Client that wants to access it. The client will request an access token at IdentityServer by providing a ClientCredentials which acts as a secret known to both the client and IdentityServer and it will use the token to gain access to the API. The protocol used in this Template is http and the port is set to 5000 when running on Kestrel or a random one on IISExpress. You can change that in the Properties\launchSettings.json file. However, all of the quickstart instructions will assume you use the default port on Kestrel as well as the http protocol, which is sufficient for local development. An API is a resource in your system that you want to protect. The next step is to define a client that can access this API. That’s it - if you run the server and navigate the browser to http://localhost:5000/.well-known/openid-configuration, you should see the so-called discovery document. This will be used by your clients and APIs to download the necessary configuration data. At first startup, IdentityServer will create a developer signing key for you, it’s a file called tempkey.rsa. You don’t have to check that file into your source control, it will be re-created if it is not present. Next, add an API to your solution. 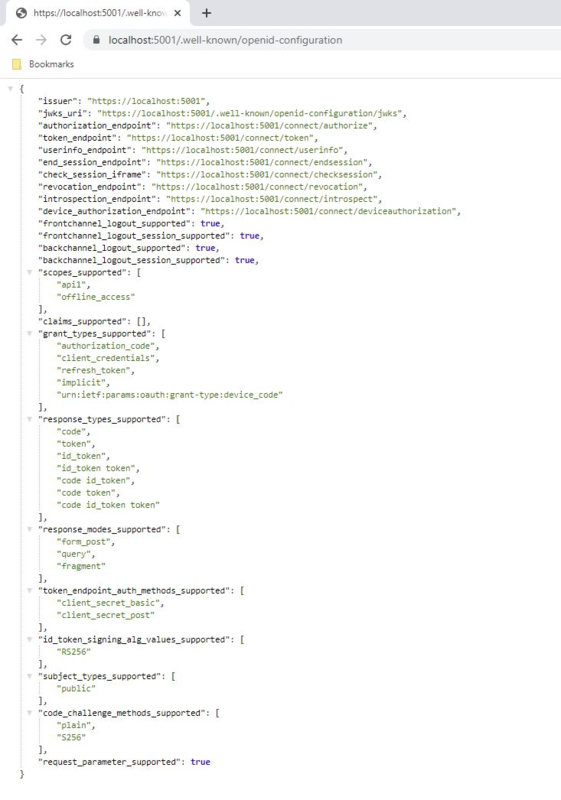 This controller will be used later to test the authorization requirement, as well as visualize the claims identity through the eyes of the API. AddAuthentication adds the authentication services to DI and configures "Bearer" as the default scheme. UseAuthentication adds the authentication middleware to the pipeline so authentication will be performed automatically on every call into the host. Navigating to the controller http://localhost:5001/identity on a browser should return a 401 status code. This means your API requires a credential and is now protected by IdentityServer. Open up Program.cs and copy the content from here to it.. The token endpoint at IdentityServer implements the OAuth 2.0 protocol, and you could use raw HTTP to access it. However, we have a client library called IdentityModel, that encapsulates the protocol interaction in an easy to use API. 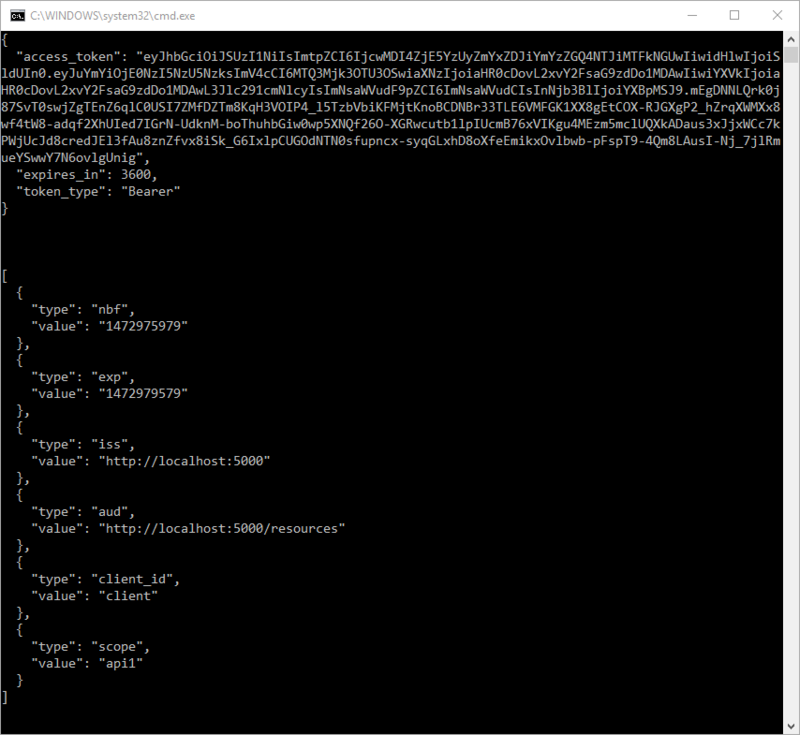 Copy and paste the access token from the console to jwt.io to inspect the raw token. By default an access token will contain claims about the scope, lifetime (nbf and exp), the client ID (client_id) and the issuer name (iss). You can now try to provoke errors to learn how the system behaves, e.g.